Hanuman and Lionheart will share the King’s Hundred Guinea Cup after finishing tied on corrected time in the first race of Palma’s Superyacht Cup. They actually finished second and third respectively across the finish line behind Ranger, which subsequently accepted a penalty for a rules infringement on the approach to the first leeward gate. 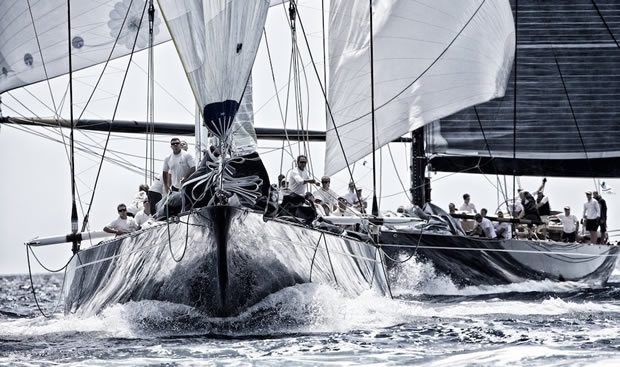 It was the closest and most exciting racing for the J Class yet as the five boat fleet for Palma’s Superyacht Cup contested the prestigious trophy. From a spirited, very evenly match contest which saw three different leaders at successive windward mark turns, Ranger had lead around the final turn, eking out a decent lead to finish first across the line. But with Ranger taking an arbitration penalty after a port-starboard incident as they approached the first leeward gate which dropped them to third Hanuman – winners here last year – and Lionheart – winners of the Menorca Maxi event last month – could not be separated on corrected time. There were mistakes aplenty. While two of the five Js had well timed starts at either end of the line, in the middle two had scrappy openings which set them immediately on the back foot. The three rounds windward-leeward race, contested in 9-14 kts of SSWerly breeze saw three different leaders at successive windward marks, with places changing throughout and invigorating close quarters boat handling. Ranger, with four times America’s Cup winner Murray Jones calling tactics, read the wind changes and – crucially – got themselves in positions to capitalise. The Bay of Palma can sometimes be a one way, one sided race track in the standard sea-breeze conditions, but the first contest of the Superyacht Cup for the J Class offered ample chances for gains and losses as the breeze tracked right and built for each round. Early leader Velsheda dropped to fifth across the finish. Rainbow, at the back of the pack through the first leeward gate went to the right up the second beat to lead Ranger by a nose at top of the second round before Ranger had established a more meaningful lead up the final beat. Ironically both the joint trophy winners had suffered off the start line together and had to fight back. Lionheart was early on the line and Hanuman started downspeed while Velsheda started well at the signal boat end of the line with better speed. But both worked the shifting breeze well, Hanuman crossing the finish line nine seconds ahead of Lionheart, which has Bouwe Bekking calling tactics.